MONDAY JULY 23rd through SATURDAY JULY 28th the Carousel and Museum will be open daily 11:00 a.m. - 8:00 p.m. The world famous Kit Carson County Carousel first operated in its current location 90 years ago, in 1928, during the Kit Carson County Fair! Come capture a part of history by taking a 25¢ spin on this magical amusement during one of the best county fairs around! The Carousel and Carousel Museum will be open 11:00 a.m. - 8:00 p.m. daily Monday, July 23rd through Saturday, July 28th during the Kit Carson County Fair. Please note the Carousel and Carousel Museum will be closed 3:00 p.m. - 4:00 p.m. daily, during fair week for cleaning and maintenance. There will also be other brief closures throughout the week to accommodate official fair events and ceremonies held in Carousel Park. 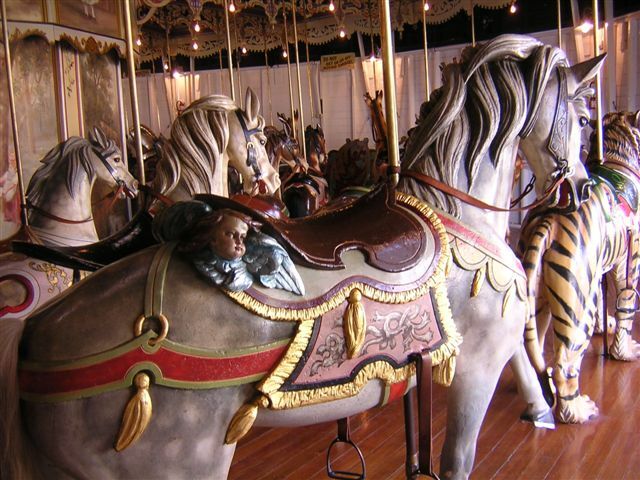 The Carousel Museum is celebrating its eleventh season and welcomes visitors to cool off and take in the hands-on experience of learning everything about carousels and the magic they spin. Admission is $1.00 per person, ages 10 years and up. Children aged 9 and under are FREE with an accompanied adult. Don’t forget to visit the Carousel gift shop, Hoofbeats! There are several new items to check out, and of course, you’ll want to get your annual Kit Carson County Carousel t-shirt featuring the Angel Horse. Come vote for your favorite carousel animals! It’s just a penny a vote with unlimited votes and each vote helps feed and house all of the animals at the world famous Kit Carson County Carousel!